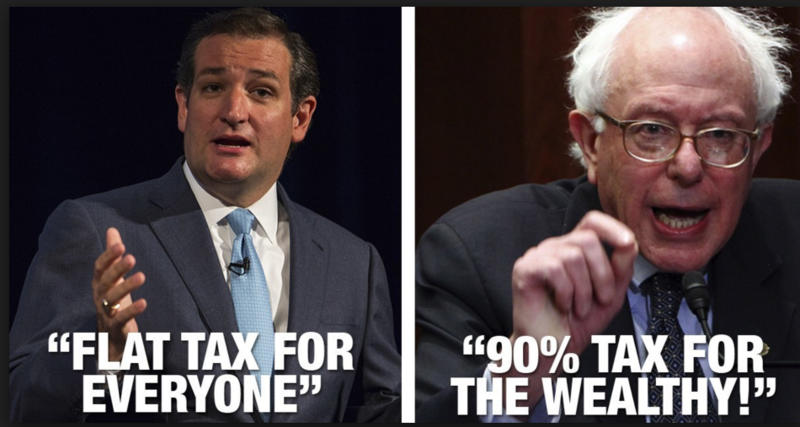 Bernie Sanders Wants a 90% Income Tax Rate-Truth! & Fiction! - Truth or Fiction? Bernie Sanders Proposes 90% Income Tax Rate-Truth! & Fiction! Bernie Sanders wants to raise the income tax rate to 90%. Bernie Sanders once said that a 90% income tax rate for top earners “wouldn’t be too high,” but he later said he wouldn’t support that if elected president. HARWOOD: Have you seen some of the quotations from people on Wall Street, people in business? Some have even likened the progressive Democratic crusade to Hitler’s Germany hunting down the Jews. SANDERS: It’s sick. And I think these people are so greedy, they’re so out of touch with reality, that they can come up and say that. They think they own the world. What a disgusting remark. I’m sorry to have to tell them, they live in the United States, they benefit from the United States, we have kids who are hungry in this country. We have people who are working two, three, four jobs, who can’t send their kids to college. You know what? Sorry, you’re all going to have to pay your fair share of taxes. If my memory is correct, when radical socialist Dwight D. Eisenhower was president, the highest marginal tax rate was something like 90 percent. HARWOOD: When you think about 90 percent, you don’t think that’s obviously too high? But during a Democratic presidential debate in the following November, Bernie Sanders said that he would not support raising the top income tax rate to 90% after all. Sanders said, “We haven’t come up with an exact number yet … but it will not be as high as the number under Dwight D. Eisenhower, which was 90%.” Sanders’ campaign hasn’t released any more information on his proposed tax policies, so it’s unclear what top interest tax rate he would support for America’s richest. There’s confusion about who, exactly, would be subject to the higher income tax rate. A marginal tax rate only applies to income above a set level. That means the higher tax rate would only apply to annual earnings above about $410,000 for individuals, or $460,000 for couples. Overall, about 1.3 million people would be subject to the higher tax rate (only on income above those thresholds). And it’s true that the top marginal tax rate was 90% under President Eisenhower. President Kennedy slashed the top marginal tax rate to 70% during his presidency. President Reagan slashed the top marginal rate to 50% and then to below 40%, which is where it remains today, according to historical tax data provided by the Tax Foundation. Marco Rubio Plagiarized Barack Obama’s 2008 Iowa Victory Speech-Reported as Fiction!